Columbia University Professor and Economist Joseph Stiglitz gives the Quest audience his view on the state of the economy. 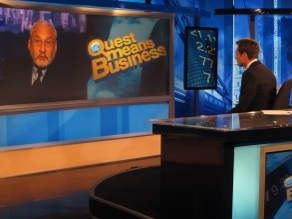 Nobel Prize winning economist Joseph Stiglitz joined us on Quest Means Business today. He told guest host Max Foster the U.S. needed more stimulus and that the country could “clearly” afford it. Stiglitz also said, both the U.S. and Europe need to focus on the “direction of spending” and believes there could be dire consequences if they don’t. “I think it's more likely that the United States and Europe may sink into what might be called a Japanese-style malaise. Growth might be a little higher than in Japan, because in Japan, population/labor force growth was zero,” Stiglitz said. So what do you think? Did the spending on the war in Iraq help bring the U.S. and Europe into a recession? And could both regions be headed for a "Japanese-style malaise" as Stiglitz put it? QMB wants to know what you think. Leave us your thoughts in the comments section, join us on Facebook or Tweet Richard your thoughts to @RichardQuest. Be clever and we just might use your response in the show! the economic,financial plans,spending direction must be suitable for each country circomestances,situations. more Steve Jobs, Bill Gates and Stiglitz the brainpower would replace physical force. Mr Stigltiz has made the essential link between the destruction of US competitiveness and phenomenal rise of China. While the US was wasting a lead and political capital gained over decades and was the unprecedented world leader, GWB and his idealogues buried the US in unproductive spending. Look at the numbers, we are not putting people to work like WWII, we have a few getting rich and the cost as he points out will hurt the US for a long long time. China on the other hand, spent nothing and gained everything. Thank you GWB and Cheney for destroying the american competitiveness, hope you like your speaking contracts in China, they love you there. I think Mr. Stigltiz is hundred per cent correct in his assessment. stiglitz is bang on and very correct.It's very unfortunate that the needless war happened in iraq.Not only america it has affected the other parts of the world too,as they depend on the american market. The lesson-no to war,look for other option to find solution to intractable problems.secondly,take away powers of going to war from president to collegium of leaders. Mr. Stiglitz may be correct. However, those that want to spend also have to talk about how to repay. I is discouraging to see how 'world leaders' and politicians deal with these important subjects. Is there maybe something we are not supposed to know? 50% of people coming back from the Iraq war are disabled? Nice, completely false information used to manipulate readers and push forward your bogus claim. Mr. Stiglitz is correct. GWB secured the long term interests of Uncle Sam in M. East, but did it in a very arrogant and expensive way, in both human lives and money, destroying US reputation in the process. The decision of president Obama is in the right direction to correct the big mistakes of the past. The enormous budget conserved will have a great positive impact for your diminishing middle class, the backbone of US economy. Stimulate the production capacity of US, fine-tune productivity, educate the new generations and ... devalue the dollar. I am waiting for the day that my imported new high quality TV set will be made in US and not China. That will be the day that Uncle Sam will have the financial mess in order and BRIC countries still struggling to catch-up. US has been fighting a losing battle. Stiglitz has hit the nail on the head. Prospects of double dip recession overhang like a sword of Damocles. The country needs to press ahead with fresh round of stimulus spending to mark a robust recovery. Up until then it will be preposterous move to channel money in wars. It will be self-defeating and counterproductive move by the government. front that continiously scares the market with more war on their Agenda rather like Toy Blairs interview with BBC Insisting War With Iran 1st sept. It Seems that most Nations espesialy Super powers are on the Brink Of Bankrupcy and the bankers are Calling For more money, in respect One will see a suden Increase in inflation in the coming Months and stocks Plundging lower and safe havens in Gold asuming The Signal of Yahoo Glitch was a signal To Get ready. One can See That Goverments are also Beefing up security mesures on civil freedoms in wake up of new terror. The Sum of all these events sends a clear mesage that we Haven't hit thebottom yet and that a darker future will gain pace before a solution will proclaim Its self, By the way Bancore notes Proposed by IMF Should increase the suspician of world economical colapse. Can somebody please explain to me why the yen continues to be the world's strongest currency (in terms of relative movement recently) while Japan's economy continues to be, at best, anemic (compaed to the moribund of before)? I had travelled to Japan quite literally every summer for the past 10 or so for a holiday before the last two simply because the yen's appreciation had made other choices more attractive (I figure i could sit out a few years). The supreme irony of this is that, if anything, the strength of the yen does nothing but encourage Japanese consumers to go on junkets to Korea, China, and the like and thus to buy even fewer Japanese goods. Yes, the pound and euro deserve their recent deflation – and perhaps even quite a bit more. And, while I hate to use normative language when it comes to foreign exchange, I can't help but having this nagging feeling that the yen should be at JPY 130-140 to the USD. Believe it or not, the comment above about the two wars America got into, is what did the damage to the economy. The two wars have, according to conservative estimates, have cost America over two trillion dollars and contributed heavily to the deficit. Yet another consequence of these wars. Most of the oil America imports, comes from Muslim nations. After America marched into Iraq and Afghanistan, price of oil went up from nearly 12 dollars a barrel to almost 50 dollars a barrel. Too much money flowed out of the country, and US is paying for it. Wars don't benefit anyone. Everyone involved is a loser. They only satisfy the most radical elements in the society, the hawks like Cheney, Rumsfeld, Baker and company. Today you can add the likes of beck and Palin. America surely needs another stimulus. President Obama should convene a meeting of his economic council and invite half a dozen Nobel Laureates in Economics, and act on their collective advice and wisdom. But if China and India rise, why does the West lose? Shouldn't we acknowledge that trade is NOT a ZERO-SUM GAME, and that the world economy is INTERDEPENDENT? If the U.S. slips, so will the Chinese - it is not in their interest to have the West get into a deeper whole. China's internal situation is very fargile indeed - despite all the bullish sentiment. War in one thing and a whole economy is another. The decline of the US economy is more to do with so called globalization, where US (and European)publicly quoted companies sought out the vastly lower labour cost of ‘rice bowl’ countries (we used to call them developing countries). This is the pursuit of profit and shareholder value. The dramatically lower cost of means-of-production exported the work needed to supply raw materials and manufacture. Specific skills are no longer confined to historically capable and technology rich countries. China for example does not need to import a great deal in order to export finished goods. And recessions have now become global. The western economies didn’t see how they were and still are exporting jobs and slowly destroying their own markets. Larger and larger numbers of idle citizens becomes inevitable, and the Banking crisis merely an instance of a structural drama that governments had to deal with. All this is set against the backdrop of rapid changes to world order. However war in itself, any war for that matter, tends to divert government reserves into military spending – and that can be of limited benefit if the spending is with the supply side (eg., in the US). But it is a diversion that destabilizes – it takes resources and attention away from the fundaments of wealth creation and it's distribution. Solutions are as elusive as ever, and no one it seems has yet explained a unified picture of how the US and Europe regains mastery of economic long term planning. No commentary I have heard seems to offer a 'designer' solution for reversing the downward side of globalization and create large numbers of domestic jobs that will employ large numbers of citizens. Perhaps after all is said and done the aspiration of ‘work’ evolves by itself if the conditions are right. For the moment we seem to dwell on the archaeology of our poorly performing economies rather than seeking new frontiers. And are such things beyond political argument and leadership? I think a structural lack of work opens the door to extreme thinking – the unthinkable if austerity becomes the norm. Protectionism lurks just around the corner – perhaps it is, ultimately, the only way to govern our way out. Is the G20 the first form of Global Government? And how exactly do national governments ensure all those with a right to vote are also all those who are rightly employed? We should read Eisenhower's Farewell Address to the Nation, back in January 17, 1961. President Eisenhower expressed that day a clear vision of the treats to come. OK, we went to Iraq to avenge 9/11 and to keep Iran from conquering it. Iraq was already weak and about to get into war w/ Iran. People forget this fact and forget the US has interest in that region because of the Persian Gulf. Next, US power is so great that the world was impacted by its economic issues. In other words, without the US the international economy is screwed. And all this talk about China becoming the next great power is bull. China and US exchange the money back and forth because nobody has the buying power like the US to purchase the amount of output China has. Furthermore, China will not survive its overpopulation issues and the poor who are being left behind will eventually bite back at China's unequal system. It's all a matter of time. Economists can punch numbers all day, but everything is relative. The US war in Iraq was necessary to establish US superiority and hegemony, otherwise we'd be seen as weak and easily deterred in the international realm when in reality it is the terrorists funded by some Middle Eastern countries who are pathetic. And if anyone read up on the mindset of Muslims: compromise to them is compromising their religion, hence compromise is never an option. Plus, Israel has a nuclear bomb now and that's probably the only reason why we left Iraq. Of course war is expensive and the US citizens must work a bit harder than before but it's all worth it in the name of American freedoms and opportunities. Survival of the fittest and the people in America who aren't making it should work harder or leave. I've worked since I was 15 years old, put myself through college and now I still work because of my hard earned efforts. People who were laid off can still find a position because there are many job openings and though these open positions may not pay as much as before, at least people can have a life and make ends meat. If the extreme poverty countries can survive, Americans can definitely get through this mild rough patch too. All humans must remember nothing in this world is secure and we are all students of the world changes we experience. Blaming our politicians points fingers right back at YOU. Hopefully American culture can now bend a bit from pure consumer driven minds to more conscious, engaged and active citizens in politics and business at home and abroad. Who knows what lies ahead for all our futures because each and every American blindly agreed and entrusted our lives in the hands of other imperfect beings. **** LESSON LEARNED: ALWAYS FOLLOW THE MONEY AND NEVER BLINDLY TRUST WHAT YOUR GOVERNMENT TELLS YOU. MAKE TIME TO TEACH YOURSELF ABOUT THE REAL WORLD YOU LIVE IN. How does Mr. Stiglitz calculate that the US can "clearly" afford more stimulus spending? I've thought about the link between the massive spending on Iraq and Afghanistan for a while now, yet this is the first time I've seen anyone in the media raise the issue regarding the recession. Thank you for this QMB, a great article. How can Japan hit Europe and the US?? We're the importers not the exporters. Only by export a economy can grow. When they have a problem it doesn't hit us because we don't export more or less to Japan. It can't cost us any jobs at all. Welcome! Join us for a behind-the-scenes look at CNN.com. We don't just want to talk about what we're doing, we want to have a conversation with you to see what you think. We need your help as we continue to evolve the way news is delivered online. Q&A: How do America's gun laws compare to other countries?